The Gavita Plasma 270e LEP (Light Emitting Plasma) grow light uses a completely different technology to any other type of horticultural light on the market. The lamps themselves are incredibly small, about the size of a marble, and they contain a special gas which produces light when excited by an electromagnetic field. Because the lamp is driven by RF energy, there are no electrical contacts on the lamp itself. The special RF emitting ballast sits directly over the LEP lamp delivering its RF energy straight into it. The light produced by the plasma lamp is intense and the spectrum is much closer to that produced by the sun. However, the 41.01 produces only a little red making this version more suitable for supplementing HPS (high pressure sodium) light. Because the light produced by an LEP is so different, it can't really be compared to other lamps by using lux and lumens. 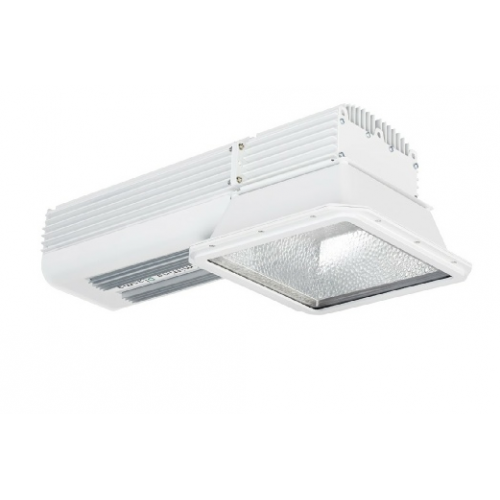 A 270 Watt LEP produces more photons than a Metal Halide and can therefore still easily cover a 1.5m x 1.5m grow area. Because the light has a wide spectrum your plants will also be healthier and happier. As if that wasn't enough, using a 270W LEP in flowering alongside 2 x 600 Watt HPS lights will greatly improve final crop quality, producing higher levels of essential oils. This is because the LEP's wide light spectrum includes blue light with a little UVA and UVB which stimulate oil production in plants. The more harmful UVC produced by the lamp is filtered out by the glass in the reflector for your safety. The reflector has been specifically designed to give an impressively wide and even light coverage and is made of highly reflective Miro Aluminium. In this version, the ballast is not contained in an air-cooling tube but in a finned case for heat dissipation. The lamp itself produces virtually no heat so the possibility of your plants suffering from heat damage is almost completely eradicated. LEP lamp life is very long and one should last about 30,000 hours which is equivalent to over 3 years of continuous use. Although LEP lighting systems may seem initially expensive, they cost about half as much to run as a 600 Watt Metal Halide lamp and require far less frequent lamp change-outs. This makes them a great long-term investment that will save you money later on. Papillon 1000w E-Light Low ProfilePapillon 1000 Watt E-Light is a fixture that is known for its cut..